As the world transitions to digital-based document storage solutions, growing numbers of banking customers require a viable solution for short and long-term document retention. 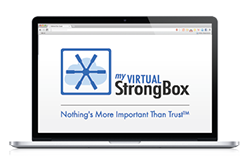 Virtual StrongBox answers this need by providing a robust alternative compatible with your online banking system or linked directly to your business website. "Pay your way" strategy minimizes entry cost while not blocking member growth. Seamless integration with OLB/MOLB, PFM and other wealth management systems. "Responsive Design" ensures compatibility with Mobile and Desktop devices. AES 256-bit encryption and Perfect Forward Security (PFS) active. Enterprise File Exchange allows document share and reduces operational costs. Only the customer has access to the documents in their StrongBox. Call our office, contact your Account Executive, or CONTACT us to arrange a demonstration. We believe you will be excited to include this in your future operational strategy.